Our rates are comparable if not less than the competition! The day you check in counts as a day regardless of check-in time. The day you check out counts as a day unless you check out by 9:00am in which case there will be no charge. We are open for checking in or out from Monday to Saturday, 8am -6pm by appointment. We are CLOSED on SUNDAYS (although we are still operating). If you need to check out on a Sunday we could open the ranch for an inconvenience fee of $45. Payment is due at check out by cash, check or CC-visa or master. Please give us a call if you would like to make a reservation. We are happy to go over the costs of your dog’s stay with you, discuss your location, the pick up and drop off schedule, and any questions you have. Two week stays -10% discount. Three weeks stays- 15% discount. Four week stays- 20% discount. Two dogs- 10% discount. Three dogs-15% discount. We offer deeper discounts for long-term stays and multiple dogs. Going to be gone a while? Have more than one dog? Ask us for the discount specific to your visit. We also ensure that dogs from the same family are accommodated next to one another, another important aspect of the personal care the Ranch can give. Your dogs will not be separated while they are at the Ranch. During holidays, discounts usually do not apply. Please talk to the Ranch regarding any situation where you feel a discount might be in order. We work very hard to keep our rates affordable – there are no hidden fees. Our rate includes accommodation, lots of playtime, making friends, love and companionship for your dog. During holidays, our daily rate is $47 per dog, per day. The holiday rate will be applicable during the Easter weekend, the Fourth of July holiday week, the week of Thanksgiving, from December 15 through January 5 (seven day minimum stay required), the Memorial Day weekend and Labor Day weekend. Generally, federal holidays are considered holidays for the ranch. A holiday over a weekend, creating a three or four day weekend, is charged at the holiday rate for each day of that period. We are always fully booked during that time, so please make an early reservation if you need care for your dog. We do require a credit card to make and hold a reservation, which will be charged a cancellation fee of three days if you do not provide at least 72 hours advance notice of cancellation. If you forget to cancell and do not show up you will be charged for the entire stay. It is very difficult to have a last minute cancellation, as we take a limited number of clients(15). Please let us know as soon as possible if you need to cancel your reservation. The ranch is a very special place, as you will know when you come for a visit. Knowing your pet is safe and happy will give you the peace of mind to enjoy your holiday or travel. We do accept animals with special needs, but there is an additional daily charge for the administration of medication and/or any other extraordinary care your dog may require. The charge depends on the needs of the animal. Basic administration of oral medication daily is $3, while more complicated needs may incur an additional charge. Please address all special needs your dog requires in detail, so we can ensure that we can provide such care. We have accommodated dogs with various conditions, including diabetes. We know Alpine isn’t right around the corner, and getting your dog to Alpine may present a problem. That being known, Alpine Dog Ranch and Retreat offers pick-up and drop-off services from Monday to Friday, in the greater San Diego area for your convenience. We do have clients from the Los Angeles, Orange County and Riverside areas. Please call the Ranch to discuss transportation arrangements for clients out of San Diego. The pick-up and drop-off fee will be $55 for most of San Diego. Pick up and drop off to North County or South Bay is $65 -$85. These are round trip costs. One way to San Diego or back is $45. If you have two or more dogs, you only pay one pick up/drop off fee. This is not a per dog expense. These costs reflect the expensive gas prices! We are closed on Sundays for pick up and drop off, as well as on holidays. Often our holiday schedule for pick up and drop off availability fills rapidly – if you need this service, please call early. If we do not have pick up or drop off available, we may still be able to accommodate your pup if you can bring your dog up to the ranch. 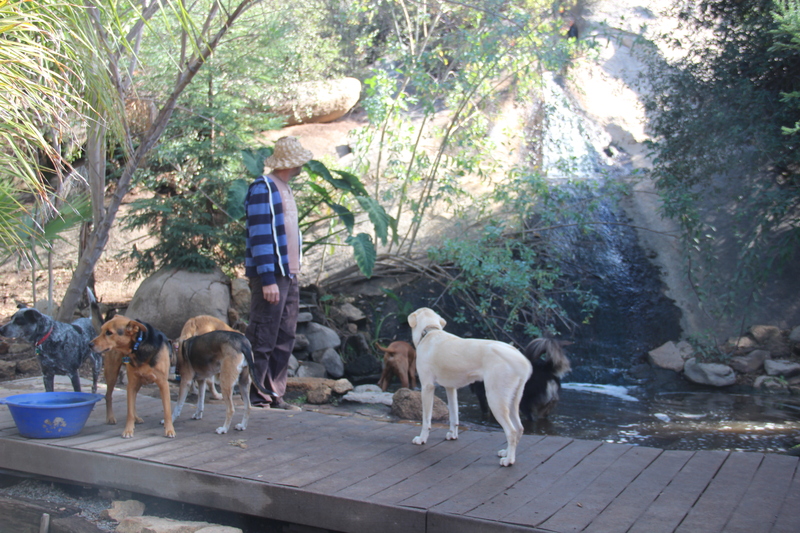 Also included in your dog’s stay at the ranch are hikes around the fully fenced, 4 acre property, all day swimming access to the waterfall and pond, lots of ball throwing, exploring, hunting, rock climbing and playing. The Ranch is unlike most kennels or boarding facilities, where playtime and walks are at an extra charge! 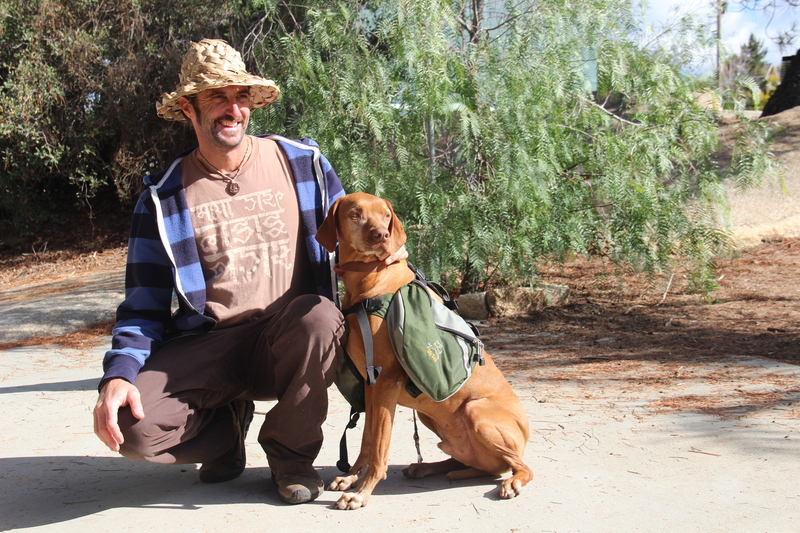 At Alpine Dog Ranch, dogs are considered to be on a retreat or vacation. Swimming, playing, hiking and exercise are part of the deal! From sunup to sundown your pup will get to experience life like a real dog, in a pack, in search of a hidden bone or a juicy tennis ball! At night your dog will retire to his private den (10ft x 4ft), with a big poofy bed, in the bunkhouse, for delicious dinner (supplied by you as he wouldn’t like a change in diet to upset his tummy). Dogs that come together may sleep together too. After dark its time for relaxation, a movie or two and zzzzzzzz…. At sunrise the excitement begins all over again with breakfast, a pee on a tree and yoga, “down dog” to be excact!! We promise your dog will come home tired and happy. It is completely normal if your pup comes home and sleeps for a few days. Few dogs get to run and play 12-14 hours per day! Often life seems to hurry us along and we find ourselves out of time for the much needed walk or visit to the dog park with our pup. We have just the solution for you! As a great alternative to day care, this is a weekend of hiking, swimming, running with the pack, socializing and games at the ranch. A commitment of six weekends is required (total cost of $750 payable upfront, expires after 6 months) You may send your pup to the ranch once per month or more up to six months. The weekend retreats may not be on holiday weekends or be combined with another visit. One week notice is required to reserve your weekend. Spaces fill up fast so let me know ASAP if you would like to join the program. With our new pool and waterfall and all the hiking trails, tons of bunnies, squirrels and lizards to hunt and dogs to play with, your dog will return happy, tired and balanced. 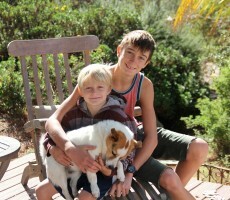 At Alpine Dog Ranch your pup becomes part of the family. Since we reside at the ranch in our log cabin your pet will have a much more comfortable and active stay than at any traditional kennel, where a variety of staff come in and out. Pets get to bond with me, Thomas, the pack leader, my wife, Keren and my children, Eden, Leila, Julian and little Lucas. Dogs, like people, enjoy being able to identify with someone. This is very important when you, their owner, is traveling and your pup is in a new environment. The Ranch provides love and personal attention for each dog. We also limit the number of guests, so as to provide the best possible care for every dog. We will not take more than 15 dogs at any one time (with the exception of the holidays when we need to accommodate all our regulars). That means your pet gets love and attention and not a kennel with a number on it! Since your dog is going to be swimming and hiking and rolling around wrestling in the dirt, it is a good idea to request a wash before going home! We offer a basic wash and towel dry for a nominal fee of $15 to $25 depending on size. We train people and rehabilitate dogs!! 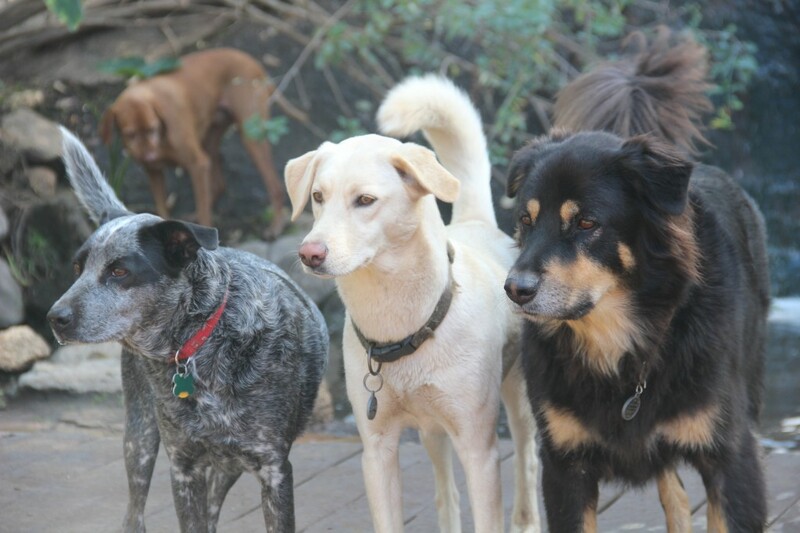 Using the “Zen Essentials” dogs will relearn social skills in a pack. They learn to be submissive and calm replacing feelings of anxiety, fear, over excitement and aggression. They learn how to act on a leash and respect their “pack”. We base our Zen Essentials on the philosophy and techniques practised by Cesar Milan, the dog whisperer. a two hour long field trip each day into the Cleveland NationalForest. one hour one on one leash training each day. 1hour training session for the dog owner. Once the dog successfully completes the Zen Training camp she/he qualifies as ZEN DOG. The cost for the Basic Program is $ 549, including boarding, training materials and a one hour follow up training session. For dogs in need of more serious behavior modification, ie. dogs with fear anxiety and or aggression, we offer an advanced program which generally lasts anywhere from 7-30 days, depending on the dogs response to the training. Call Thomas at the ranch for more information or to discuss your specific needs. Zen Dogs receive ten percent off their visits to Alpine Dog Ranch and Retreat (excluding holidays), get to go on daily field trips and receive preferential bookings at the ranch. Owning a dog can be a soul fulfilling, wonderful and enriching part of life or it can be a very stressful nightmare. Our goal is to equip you with the knowledge and tools to build a rewarding and special bond between you and your K9 friend. 1. For the health and safety of all our guests, we require that your dog be current on his or her vaccinations. The county does routine inspections and checks all dogs for proof of current vaccinations. Some of our clients go out of town unexpectedly and do not have current vaccinations. If your dogs are not current on their vaccinations for their stay, we can provide service to take your dog to the vet and have vaccinations done. Please let us know immediately if this is necessary, as we need to take your dog in on their first day at the Ranch. There is a $45 charge to take a dog to get vaccinations, as well as what the vet charges for the vaccinations. 2. We also do not take dogs that are not neutered or spayed. Unfixed males, while not necessarily aggressive, have quite an impact on the fixed males at the ranch. And unfixed females can cause quite a stir in the mountains. We prefer not to deal with either of these situations. 3. While we love our guests, we don’t love fleas! Please make sure your pet does not have fleas. Guests who arrive inflicted with fleas will receive an immediate bath, at an additional charge, so as not to share with our other guests and residents. Generally, fleas do not survive at our altitude, but we do not want an infestation in bedding or sleeping areas. 4. Please provide us with enough of your dog’s food for his or her (or their!) stay. While we do offer a peaceful place for dogs to stay, keeping a dog on a consistent diet is also important. Your dog and his intestines will be thankful. Per county regulations, food must be kept in an airtight container of some sort. Please send your pup’s food up in such a container with names clearly marked. Bringing a bag of food can be problematic, as we have to open the bag and put it in an airtight bin. Bags of food brought in that fashion can not be returned. Please understand – this is a county regulation for your dog’s health. As a licensed facility, we abide by county regulations. 5. Feel free to send your dog up with any items that you feel may be of comfort to him or her. These items may be special blankets, favorite dogs beds, or any other comfort item. However, please leave the toys at home! Who knows where they will end up on the ranch! We have plenty of great things for your dog to chew, chase and destroy. 6. If your dog has any other special needs or things that we need to know to take the best possible care of him or her, please let us know! If your dog does not like either men or women, has a special habit, or cannot be kenneled, we need to know. If your dog shows aggresion towards children or other dogs this might not be the best option for him/her. 7. We also have a 72 hour cancellation policy. Because we only take a small number of dogs, we often have to turn potential guests away. This is hard enough, but it makes it more difficult when we have no-shows or other short-term cancellations. If you cancel without 72 hours notice, we do require a payment for a one night stay. The cancellation for holiday periods is one week of notice to cancel a reservation. Failure to cancel on time results in a charge for three nights. No shows will be charged for their entire stay. We fill up very quickly on holidays, and have to turn dogs away. Please let us know if you make a reservation and your plans change. 8. Although our Ranch is fully fenced, dogs that are escape artists will be able to find a way out. A traditional kennel might be the only safe option for you. If your dog escapes and is found(we have never lost a dog) he will be kenneled for the duration of his stay. The same applies to dogs that show unnatural aggression or hurt another dog or person. 9. 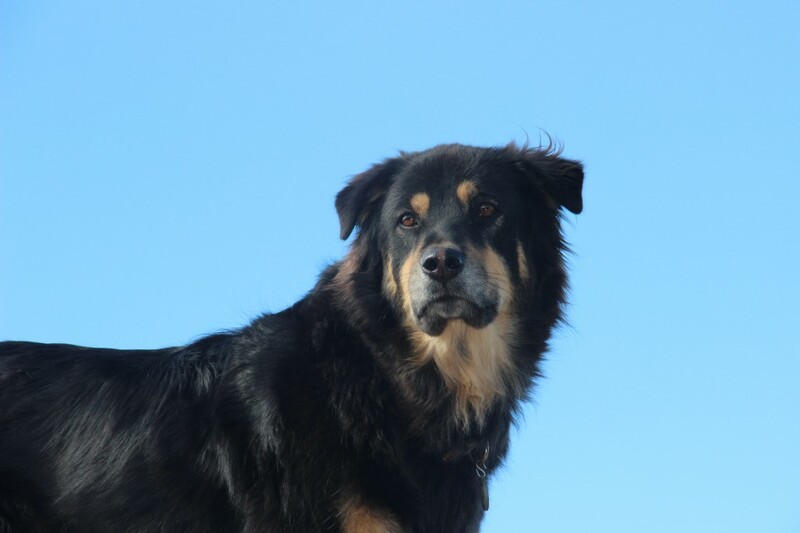 All new clients need to visit and tour the ranch before your vacation begins so we can make sure your dog will enjoy the mountains and be able to handle the social nature of the ranch. The tour takes about 30 minutes. Please bring your pup along. 10. In case of an emergency, we use our vet, Dr Hakket, in Alpine. In case of fire, we have an evacuation plan rehearsed and in place.